On my way to the Vuelta a Tacos in September I rode by Chicago's City Farm on Division and was really stricken with the beauty of a verdant patch of agriculture in the middle of the city (especially as harvest approached). 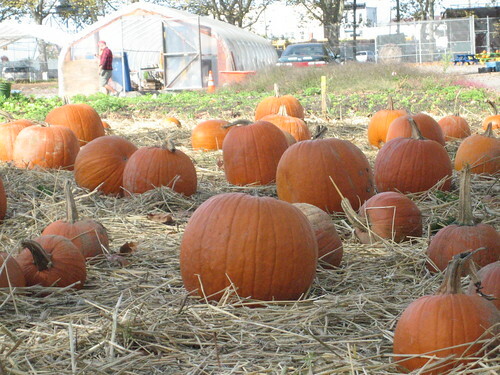 Since then, I've become enamored of the idea of urban farming. Actually, I've liked the idea since I read Karl Hess' Community Technology some time ago. (It's an account of grass-roots efforts to develop local food sufficiency in Adams-Morgan, Washington DC, and even had some interesting accounts of aquaculture!) It seems like we could use a thread here dedicated to urban farming, so here we go. 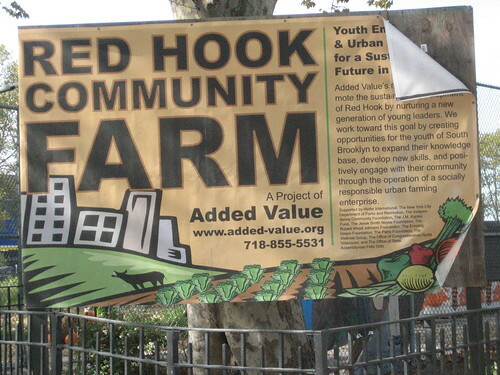 On my recent trip to New York, I coincidentally stumbled across the Red Hook Community Farm and snapped a few photos. On my way to the harvest festival, I had a fantastic grilled corn on the cob (gringo style, just butter and salt, thanks). After I came back, I picked up a Chilean empanada, which had ground beef, raisins, some hard-boiled egg, and probably a few other things in it. It was juicy and drippy and very tasty. And for my last eat in New York, I had a very fine barbacoa (goat) taco from another truck, which, now that I think of it, was also juicy, drippy, and tasty. The vendor scene was actually pretty subdued, but put together with a visit to the harvest festival, it made for a nice last morning in the Big Apple. Oh yeah. In a slightly different vein, I saw some interesting information about a project called P.F. 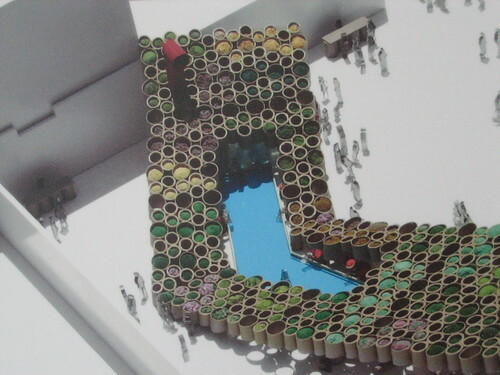 1 (Public Farm 1) which was selected as the winner of MOMA's Young Architect's Program. I was installed at P.S. 1 in Queens, which I was not able to visit, but I did see some of the design drawings at the Manhattan MOMA. 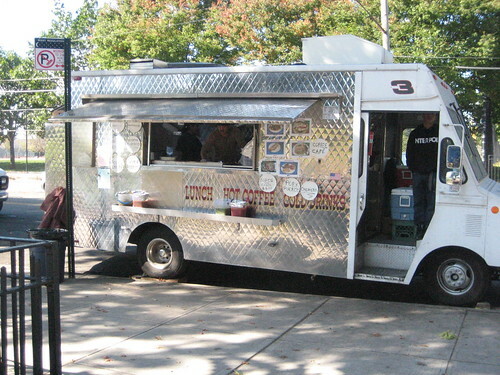 I was at the Red Hook food vendors the very same day! 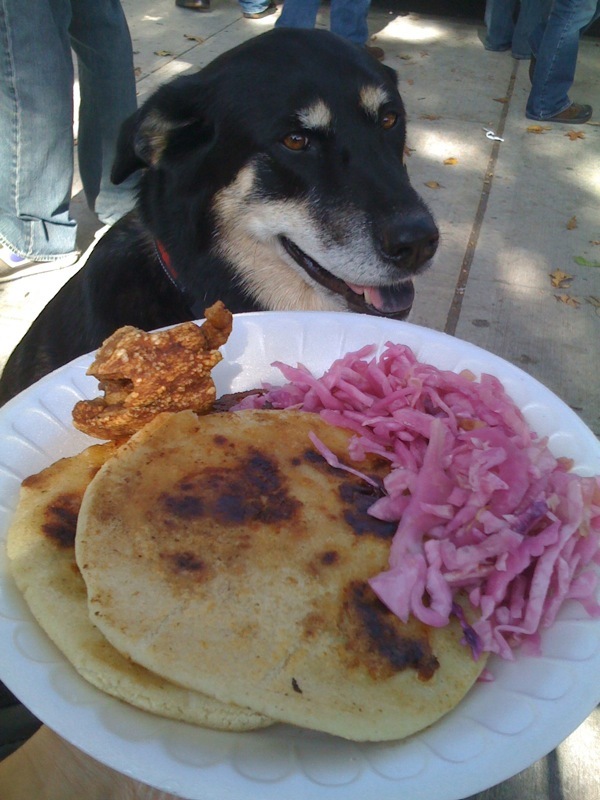 My dog Kiba and I shared a chicharron and loroco flower pupusa plate. germuska wrote: It seems like we could use a thread here dedicated to urban farming, so here we go. Urban farming is something that a few of us in the Wicker Park/Ukrainian Village/Bucktown area have discussed while meeting about our rooftop garden projects. Although I don't want to speak for our little group, I personally believe that urban farming is doable but the traditional in-ground farming is more difficult that it seems. Contaminated soil and amount of space needed typically are the biggest hurdles. Next, the cost in equipment and labor can also be a challenge. Many people with whom we share our ideas have supported the idea of SIPs (sub-irrigated planters) in place of traditional land based farming for the urban environment. With the planters, you need not worry about contaminated soil and you can be organic from day one. More importantly, for me, is that any individual can contribute or "farm" on their own land. Chicago has many flat roofs in the city and these planters have proved successful on the roofs in the few years our group has used them. 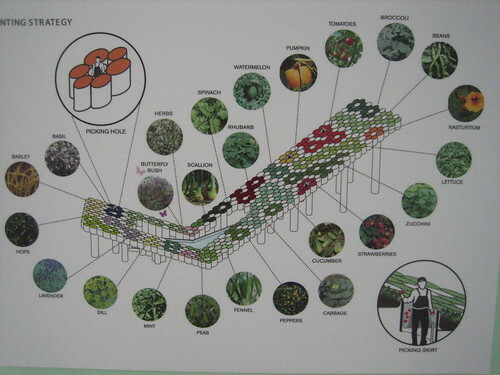 This concept, most notably, has already taken off in Montreal (see: http://rooftopgardens.ca/en). 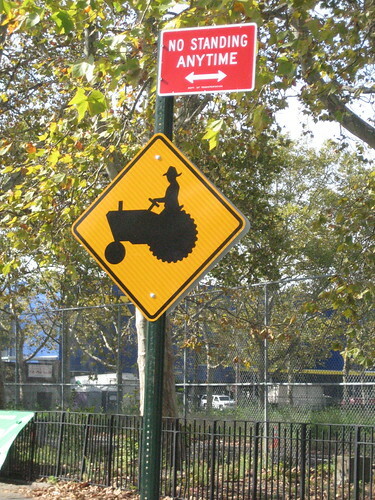 We've also been communicating with Bob Hyland in Brooklyn about many of these ideas. Bob runs a blog called Inside Urban Green (http://www.insideurbangreen.org/) where he discusses many facets of urban agriculture. His latest post focuses on an urban farm in Newark that uses Earthboxes instead of turning the ground. 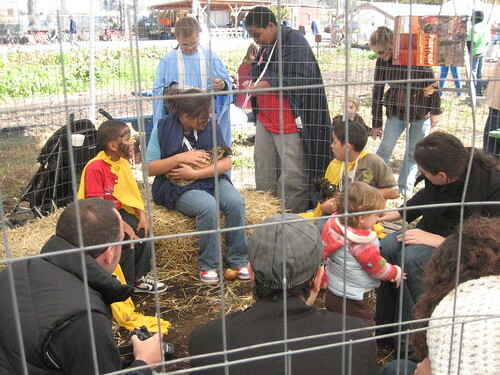 He's discussed the Red Hook farm in articles as well and is a strong supporter of SIPs for urban farming. 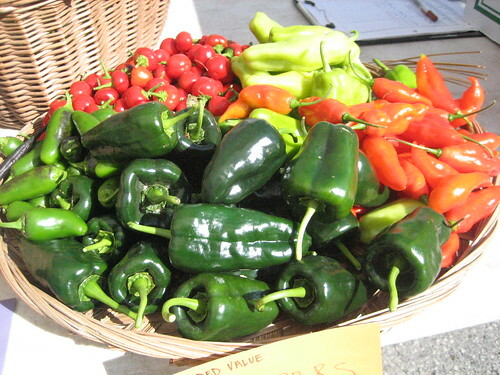 I feel that Chicago is an ideal city for SIP urban farming with it's overabundance of flat roofs, its recent "green" history, and the overall need for fresh produce in our food deserts. I know I've mentioned this before but our little group also has a blog that discusses these topics and has links to many more resources. We will be putting forth a stronger effort for '09 and start posting more resources in February. I'm sorry for the links to the other blogs but there's just way too much information there to paste here. Also, if you'd like to learn more about our local blog and efforts, please feel free to PM me. tyrus wrote: I'm sorry for the links to the other blogs but there's just way too much information there to paste here. Also, if you'd like to learn more about our local blog and efforts, please feel free to PM me. For me, I think yours epitomize the kind of response that doesn't need to apologize for linking to other blogs. That discussion elsewhere on LTHForum is targeted at people who post nothing but a link; your thorough, thoughtful response was not that at all. Mike G wrote: Meanwhile, Bruce F. is a Wicker Park resident who read about Earthboxes in the Reader, and subsequently built about 30 DIY ones out of Rubbermaid tubs on his garage, as well as a Flickr page that tell you all about how and why you should do it too. He’s a thoughtful guy who really brings a lot of perspective to the broader issues surrounding the act of growing your own food in the city, in a way that kind of reminds you of John Cusack’s character in Say Anything. There's some LTH discussion here. Bruce F is part of our little growing group. He volunteered to start the blog in which I participate. I thought Mike G did an excellent job of capturing the reasoning behind what drove Bruce to start his personal project. Since the filming of that episode, we've seen a lot more interest in the SIPs for gardening. I think part of it has to do with the US population's interest in growing vegetables and trying to find the best bang for your buck (or mostly "hours"). I've been wanting to provide better documentation and planting guides for the SIP, especially for the urban farmer. I've also wanted to extend this knowledge to my neighborhood/community as a means of supplementing their own food bills. I'm taking the winter to brain storm and try to map out a plan to share these ideas and resources and most likely, it'll be tracked on our blog. Thanks for starting the post, I think it's a great topic for this board and covers a variety of issues for which many posters seek advice - localvore resources, sourcing high quality vegetables, farmer's market/csa, etc. tyrus wrote: I've also wanted to extend this knowledge to my neighborhood/community as a means of supplementing their own food bills. I'm taking the winter to brain storm and try to map out a plan to share these ideas and resources and most likely, it'll be tracked on our blog. In addition to posting on your blog, I hope you'll post about any meetings here. I live in your neighborhood, and would be interested in knowing more about this topic. I also know people who might be interested that are already involved in community gardening in West Town. FWIW, I totally agreed with Bruce F.'s comment in Sky Full of Bacon about rooftop decks -- that they're billed as an amenity when they're not -- when I had one, it was practically unusable because it was so unbelievably hot up there. Had I known about earthboxes back then, I would have had those up there instead of patio furniture. P.S. Are you affiliated with the Ukrainian Village gardening club that does various parkways throughout the neighborhood? I find those to be such a neighborhood beautifier -- I especially like that some of the gardeners use plants reclaimed from lots that are being torn up for new development. aschie30 wrote: P.S. Are you affiliated with the Ukrainian Village gardening club that does various parkways throughout the neighborhood? I find those to be such a neighborhood beautifier -- I especially like that some of the gardeners use plants reclaimed from lots that are being torn up for new development. I'm not affiliated with the Ukrainian Village gardening club but they do a great job. I walk my dog a lot in the neighborhood and met a few people that volunteer with that group. I also have donated a few plants (dwarf spruces) when I made my four block move about a year ago. I'm not really a "gardener." This year is my first in making a true effort in planting vegetables. It more comes from what I want to eat rather than what I want to grow - if that makes sense? My goal is strictly to see what food grows here, when to start it, where to buy it, how to protect it, how to preserve it, how to maximize the yields, extend the our "Chicago" season, and finally, how to prepare it. Some of that means learning how to "garden," I know but I'm pretty focused on the food part of it. The SIPs make things really easy as well. I knew nothing when I started and picked up a few things along the way but I'm sure there are many more people that know more about "gardening" than I do. The thing is, the SIP is different than traditional in-ground gardening; even though you use some of the same principles. It's sort of a gardening for dummies version (for me anyway). One of the reasons we rooftop gardeners got together is that there were limited resources for not only vegetable gardening in the city but specifically, using the SIP medium. Some of us were talking about giving demos at the park district, so if we do, I'll make sure to post here. Thanks for the reply. 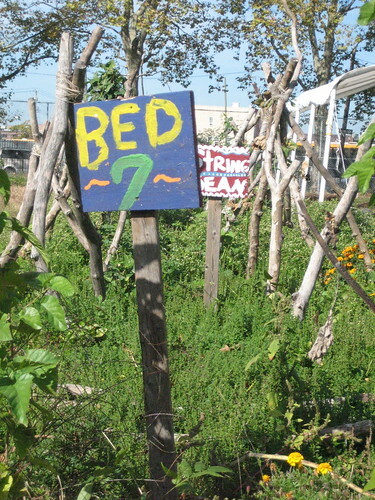 Kimbal Musk, brother of Tesla founder Elon Musk, is planning on bringing his Brooklyn, N.Y.-based Square Roots urban farm to Englewood on about 3 acres of city-owned property behind Whole Foods Market at 62nd and Green streets.